I own a beautiful bay roan, that looks totally like a blue roan in Fall and Winter, and will only turn 5 this Spring. My brother was just diagnosed with Cancer 3 months ago, and I've just been diagnosed with Chronice Kidney Disease stage 3, and I have other health issues, so we decided that we needed to sell my newly broke/gentled mare Piper. A friend of mine takes horses in and does tune ups on them, then she sells them. She has many resources and since my mare had set for about 10 weeks due to a hot nail and other hoof issue, I figured she needed a tune-up. So, I assigned her to this friend of mine, since I needed her gone quickly to take care of these health issues. Sadly instead of working with Piper daily, this friend let her sit, and she did not put her up at her own place, but according to her, due to Winter mud, she placed my mare at a friend's house where there is an arena to ride in and it's much drier, etc. and I was assured that this friend is very knowledgeable and responsible and that my friend would be there a lot to work with my horse. She would get 20% from the sale, and the horse, would sell for $2,500 and my Western Saddle would sell for about $450 on top of that. Sadly my friend didn't seem to work my horse as regularly as I would have liked, and Piper sat too long and then when this third party friend tried to ride her, Piper crow hopped and showed that she would need more of a tune-up than first thought. I kept telling my friend that Piper shouldn't sit that long, but she didn't listen, and it was not good that she would have to drive to this third party that was now involved to work with my horse. It was now past Christmas and I had given her Piper in late October. One early morning at about 6:00 AM, I got a text from my friend saying that "Piper got her back legs caught in the fence. One leg is just missing hair, the other leg took more of a beating", those were her exact words. She said she took care of the vet, but Piper would need stall rest and would need at least 6 month to heal. Then I asked for a photo, I had had a call with my friend and was also told there wouldn't be much of a scar, and all was downplayed, oh boy was that wrong, this injury is severe! Piper would not be sold or ridden for a long time and to tell you the truth, I still cannot imagine how Piper got this injury. The reason I am now posting here, is because I am wondering who is liable? It's been two weeks since this happened and my own Vet said this wound needs to be irrigated daily and have the bandages changed daily! It is cut to the bone and cannot even be stitched together. Today I found out my "friend" is only changing the wraps every 4 days, at least that is what she says, it may even be weekly, as the photo now looks like she let it drain and then ripped the new skin off when she finally did change wraps. I don't know what she is or isn't doing, but my mare isn't getting the best care! I have no boarding place for her now, and am too ill to care for her myself. There were no contracts signed and no waivers of liability! This was a hard lesson to learn! Piper shouldn't have to suffer for it and I may just have to give her to a rescue if possible. Any tips or info would be much appreciated. Graphic photo attached! Last edited by loosie; 03-10-2019 at 07:10 PM. She should be liable because she moved the horse from where it should have been located due to winter weather and the horse was injured severely under her horrible care. If you didnt make a contract your both likely liable now. Sorry. Call aspca and surrender her. She gives no cares if the world were to end for this animal and you are letting this continue. Walkamile, KigerQueen and Acadianartist like this. Last edited by loosie; 02-14-2019 at 11:21 PM. I am not letting this continue, I called my Vet today and found out about the poor care TODAY! I will gladly surrender her to a nearby horse rescue that I've checked out! I have given only love to this horse, and now this! Thank you for your opinion. I found this out today! I am already working out how I can place my mare elsewhere. My biggest concern is not letting her end up with a kill buyer. Please conform to the rules of this forum and try not to be insulting. You don't know me at all, and I didn't know this was going to be the poor care my horse would get! Thanks! Blue, Acadianartist, BarbandBadgerandPedro and 1 others like this. Last edited by Pipersmom; 02-14-2019 at 11:31 PM. Well you could try to sue her but chances are you wouldn't get much. The horse is a money pit now, badly injured and will be out of work for at least 6 months, if not more by the looks of that wound. if this trainer doesn't want to take care of the horse properly, you might want to look at giving it away or euth'ing. Jeez! I'm so sorry to hear your story. If you had nothing in writing, I don't have a clue whether you could hold your 'friend' liable in any way. But for the sake of the horse you need to get her out of there Pronto! She needs intensive care if she is ever likely to heal. If not, or it will involve too much suffering, you'll need to make the hardest decision. Considering your situation, you could go to a rescue - or someone able to give the care she needs - & see if they will take your mare on, with the proviso that if she becomes sound & saleable then you will get a cut...? Acadianartist and Whinnie like this. Last edited by loosie; 02-14-2019 at 11:37 PM. I do not plan to euthanize. She is a young horse. I will get her good care and she can still be a pasture pet with a good life! Thank you! I do not care if I make money off of her at this point. It's about her quality of life! phantomhorse13, waresbear, Change and 3 others like this. Thank you so much! I don't even care to get a cut, I just want my mare to get good care and heal up. Her life has been altered greatly and I feel partly responsible for trusting the wrong person. I am making calls and sending out e-mails to rescues already! Thanks again! loosie, Walkamile, phantomhorse13 and 2 others like this. That sounds like good course of action. I didnt mean to insult you Piper. You are not to blame for your illness.Your friend may be less likely to wish to pay a proper vet bill which is very important. loosie, Walkamile, waresbear and 2 others like this. I understand that. And you are right about that. From what I heard from her today, I cannot even be sure that the man who came out on the night of the injury was a real vet. She claims she can't remember his name, and lost his card, when I asked who he was. She said I wouldn't know this "Vet" because she had to save money. 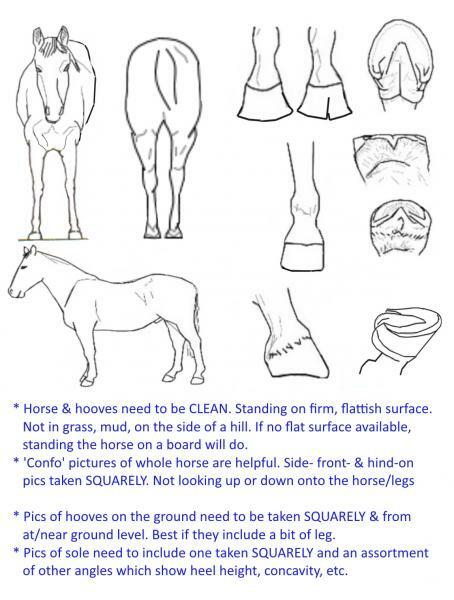 I also wanted to post this here for another reason, it's almost Spring and soon many people will be sending their horses to their trainers for tune-ups for either 30, 60, or 90 days. This could happen to anyone. Most people do not sign any type of agreement when their horses go to training. I hope this horrible event will open some eyes. I am working hard to get Piper out of that place! My Vet is also helping me. I am not going to let her suffer, each day is one too many! I got my own vet involved asap! loosie, Walkamile, phantomhorse13 and 4 others like this. It is getting a bit late here, at least for me. I am going to sign out for a bit and head over to my e-mail so I can e-mail another horse rescue. I'd like to reach as many as possible in the next 24 hours. My vet will be calling me again tomorrow. Even my doctor has reached out to a couple of aquaintances that own horses and have rescued horses before. I'm keeping my fingers crossed. I will check back here later or early in the am. Thanks to all of you for your input. I just want what is best for Piper. She didn't deserve this! loosie, phantomhorse13, waresbear and 5 others like this.